I always thought moms had the advantage when it came to the annual day of celebration. We get the day off; no cleaning, shopping, ironing, laundry. Just a day off! Breakfast in bed followed by some good old fashioned relaxation (a truly foreign word to an active mom) and then maybe a late brunch, dinner or as my sister’s family enjoyed, “dunch”, a 3:00 meal that combines dinner and lunch. Then I began researching Father’s Day and discovered that the element of good old fashioned “family time” was the main ingredient being dished up for this holiday. It seems for dads, the ideal outing is at home, in the backyard and near the grill. Some enjoy the day off enjoying their wives, specialties including barbeque ribs and old family recipes, and a few celebrity chefs like to get into the kitchen and cook, especially with their children. 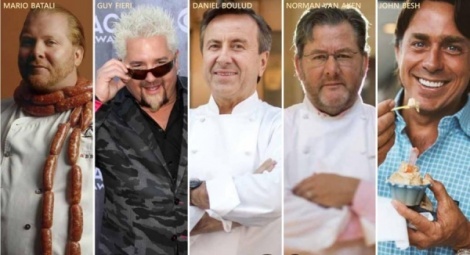 So here’s a look at what some Celebrity Chefs do on Father’s Day. Relaxing and spending time with family is clearly the Best! Happy Father’s Day to all the Happy Herald Dads. You are truly valued and appreciated! Mario Batali TV chef, restaurateur, author of Italian Grill. Guy Fieri Host of Food Network’s Diners, Drive- Ins and Dives, Guy’s Big Bite, and Ultimate Recipe Showdown “This weekend I’m packing up the RV and heading to Infineon Raceway in Sonoma for NASCAR with my boys, my wife, my parents, and a group of great friends. I’m sensing the food will be a nice combo of marinated, grilled, sliced meat. What better way to celebrate Father’s Day than with family, friends, good food and fast cars?”. "My daughter Alix and I always celebrate with a meal, and usually we want to eat together first thing, so we do breakfast. She doesn´t cook for me- we usually go out or I host her, but it is quality time that we are together. She loves good caviar, so we would usually have that for her, but also because I think I deserve it too!". Keith Snow-Creator and chef of HarvestEating. com. Chef Van Aken will be spending Father’s Day with his son, Justin, with whom he just wrote a book called, My Key West Kitchen". Father’s Day weekend is also a festival in Key West named Key West Bacchanalia,” said Van Aken. “Justin and I will be cooking together that weekend out of our cookbook in a restaurant I used to work in. Cooking with my son on Father’s Day…. yes [I will] be happy.” Van Aken also tells us he can’t wait to dig into his wife’s famous BBQ ribs. Chef John Besh Grilled Watermelon, Tomato, and Goat Cheese Salad. The hotter the grill, the better the grill marks will be on the watermelon slices. John Besh likes to brush spicy Pepper Jelly Vinaigrette over the melon before it´s grilled, because the sugars quickly caramelize, imparting incredible flavor. Feel free to substitute whatever vinaigrette you have on hand. From My New Orleans: The Cookbook 2009 Andrews McMeel Publishing. Grilled Watermelon, Tomato, and Goat Cheese Salad. 1. Light a charcoal or gas grill. Brush the Pepper Jelly Vinaigrette over each watermelon slice. Let the watermelon marinate for a few minutes before placing on the hot grill. Grill each side of the watermelon slices for several minutes, remove, cut into large serving pieces, and arrange on a platter. 2. Whisk together the olive oil, vinegar, garlic, sugar, and basil in a small mixing bowl. Season with salt and pepper. Add the tomatoes and toss to coat them well, then scatter them over the grilled watermelon pieces on the platter. Toss the lettuces in the vinaigrette remaining in the bowl. 3. Crumble the goat cheese over the tomatoes and watermelon. Scatter the dressed lettuces, then the fresh herbs, over the salad.